For the book, see American Conservative (book). 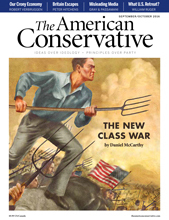 The American Conservative (TAC) is a bi-monthly magazine founded in 2002 and published by the American Ideas Institute. The publication states that it exists to promote a conservatism that opposes unchecked power in government and business; promote the flourishing of families and communities through vibrant markets and free people; and embrace realism and restraint in foreign affairs based on America's national interests. The idea of The American Conservative was that there were enough who disagreed with mainstream conservatism—libertarians, paleoconservatives, and civil libertarian conservatives, among other dissenters—to warrant such a publication. While other conservative magazines like National Review and The Weekly Standard marched more or less in lockstep with the Bush Administration, The American Conservative argued for a different course—sometimes with greater ferocity than the major political magazines on the left. McConnell served as the magazine's first editor, followed by managing editor Kara Hopkins. Before the 2006 midterm elections, The American Conservative urged its readers to vote for Democrats, saying: "It should surprise few readers that we think a vote that is seen—in America and the world at large—as a decisive “No” vote on the Bush presidency is the best outcome". As of 2007, Buchanan and Taki ceased to be involved with the editorial operations of The American Conservative, although Buchanan continues to contribute columns. Ron Unz was named publisher in 2007. In 2011, Wick Allison became the magazine's publisher, followed in 2013 by Jon Basil Utley, the current publisher. In 2010, Daniel McCarthy succeeded Kara Hopkins as editor. In September 2011, the magazine introduced an editorial redesign of its print publication and in May 2012 a redesign of its website. In October 2014, Benjamin Schwarz, the former national and literary editor of The Atlantic, was named national editor of the magazine. In November 2016, Robert W. Merry succeeded McCarthy as editor, with Lewis McCrary and Kelley Beaucar Vlahos as Executive Editors. After Merry's retirement in July 2018, W. James Antle III was named editor. In 2009, Reihan Salam, National Review editor, wrote that the publication had "gained a devoted following as a sharp critic of the conservative mainstream". The American Conservative has become one of the more dynamic spots on the political Web. Writers like Rod Dreher and Daniel Larison tend to be suspicious of bigness: big corporations, big government, a big military, concentrated power and concentrated wealth. Writers at that Web site, and at the temperamentally aligned Front Porch Republic, treasure tight communities and local bonds. They’re alert to the ways capitalism can erode community. Dispositionally, they are more Walker Percy than Pat Robertson. At an event at the University of New Orleans in March 2017, Hillbilly Elegy author J. D. Vance shared: "I did this interview with Rod [Dreher] at The American Conservative magazine [...] and then the book [Hillbilly Elegy] exploded!" Some notable contributors throughout the years at The American Conservative have included Andrew Bacevich, Doug Bandow, Pat Buchanan, Rod Dreher, Leon Hadar, Peter Hitchens, Samuel P. Huntington, Roger Scruton, James Kurth, Christopher Layne, Michael Lind, William S. Lind, John Mearsheimer, Rand Paul, Mark Perry, Paul Gottfried, Steve Sailer, Richard B. Spencer and Jim Webb. ^ "About Us". The American Conservative. February 28, 2017. Retrieved February 28, 2017. ^ Daniel Strauss: The American Conservatives Next Step Archived 2011-08-08 at the Wayback Machine The Campus Progress, March 29, 2009. ^ "GOP Must Go". The American Conservative. 2006-11-20. ^ "California Anti-Bilingual Proposition King Ron Unz to be Next Publisher of The American Conservative". The Washington Note. 2007-03-19. Archived from the original on 2007-03-28. Retrieved 2007-04-10. ^ "The American Conservative Names Benjamin Schwarz National Editor". ^ "James Antle is New Editor of The American Conservative". The American Conservative. Retrieved 2018-11-13. ^ Salam, Reihan (2014-04-22). "Is It Racist to Date Only People of Your Own Race?". Slate. ISSN 1091-2339. Retrieved 2016-08-08. ^ Reihan Salam: The Mark Sanford Revolution? The Atlantic, March 13, 2009. ^ Brooks, David (2012-11-19). "The Conservative Future". New York Times. Retrieved 28 November 2012. "Buchanan's Takeoff" by Murray Polner, Columbia Journalism Review, January/February 2003. "Paleocon's Revenge" by Whitney Joiner. Folio: The Magazine for Magazine Management, 1 September 2002. The American Conservative by J. Bradford DeLong, May 15, 2012.